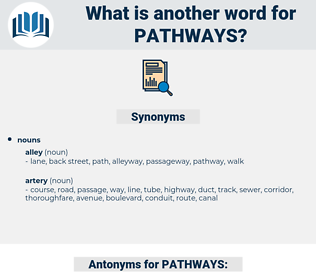 What is another word for PATHWAYS? highway, ways, progression, transport, progress, park, roadmaps, roads, interface, ET, roadmap, harm, carriage, continuum, CN, motive, santiago, S2, co, pe, Remedies, agency, rangeland, range, legal, d., lake, flow, motion, Motions, run. 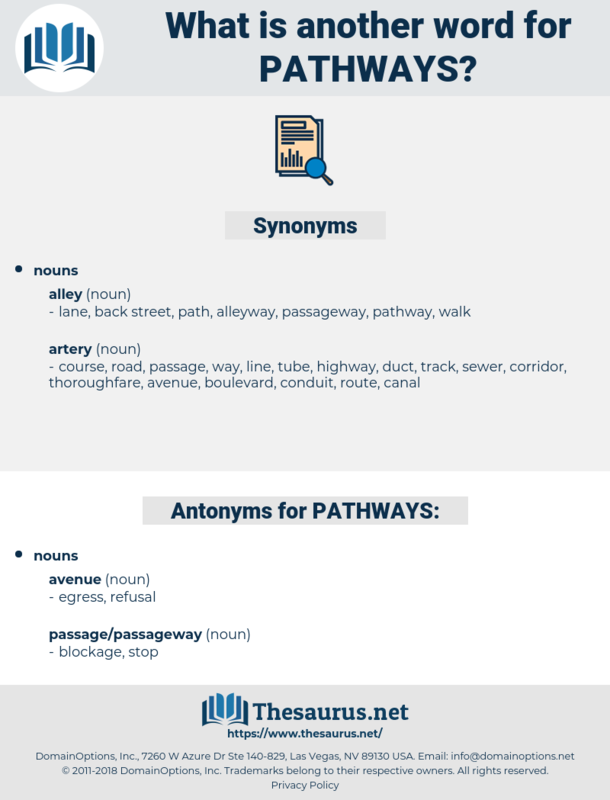 passageways, highways, thoroughfares, patterns, steps, pavements, parts, subways, mechanism, mechanisms, Instrumentalities, Templates, specializations, airways, interlinkages, relationships, alternatives, chains, molecules, paradigms, strands, crossroads, Promoters, manifestations, passages, demonstrations, airstrips, repeats, arrangements, proceedings, footbridges, runways, Achievements, Capabilities, Arteries, systems, passes, Infections, overpasses, inputs, modalities, threads, Suggestions, Ramps, courses, procedures, stretches, mechanics, Capacities, directions, structures, expressions, connections, entrances, markers, tracts, machineries, exits, Opportunities, corridors, types, penetrations, trainsets, quarters, transits, segments, alternates, acts, PROSPECTS, bridges, options, violations, Occupations, Keys, tiers, crossing, crossings, linkages, stripes, disciplines, sidewalks, shapes, Guidelines, points, potentials, chances, FADS, conduits, times, Lifestyles, waters, rails, phrases, hits, trains, terms, warheads, Branches, variants, insights, routings, SLOPES, methods, affiliates, processes, elements, sheets, chemins, offshoots, excerpts, moyens, portions, throes, trips, boardwalks, observances, tricks, NPMS, solutions, Distances, pistes, workings, alleys, tools, assaults, hints, footsteps, pursuits, timelines, modes, frameworks, Vehicles, Schedules, errands, Clips, assets, circuits, Industries, Journeys, Vistas, protests, Referrals, pipelines, Miles, actions, experiences, Rights, clusters, Routing, voyages, thrusts, fields, careers, Histories, outcomes, courts, Standards, links, networks, yards, Records, scripts, pleas, divisions, strips, LANES, extracts, arms, tips, clues, successions, wings, wires, fashions, launchers, trades, Travels, scopes, appearances, FORMATS, Movements, schemes, vectors, ducts, suites, wordings, rides, routers, Facilities, Lives, GRIDS, sections, ties, streets, Carriers, Ideas, Cues, outlets, Bandits, bits, LONGLINES, Dies, flights, railroads, NODES, sidings, devices, backgrounds, nets, freaks, Styles, inlets, vas, living, bonds, events, voies, reasons, kiosks, Stories, weirdos, beatings, Areas, legs, doors, subjects, Resources, pointers, Angles, choices, sets, venues, FARES, manners, access, accesses, periods, sources, webs, cars, rangelands, ranges, leads, media, Mediums, aisles, drivers, visits, models, hoses, Hauls, designs, Forums, VOTES, grounds, flows, Ones, springs, pipes, comings, kinds, lands, Formulas, Forms, Voices, powers, rounds, runs, ways, LINEs, goods, roadmaps, roads, approaches, Remedies. plans, applies, spreads, provides, considers, Journeys, means, Dies, flows, runs, channels, approaches. channels, itinerary, tract, approaches, transit, avenues, sectors, flow-through, trail, trails. walkways, Footpaths, gateways, driveways, roadways, gangways, Itineraries, Possibilities, Trajectories, Orientations, means, channels, avenues, sectors, trails. inaction, halt, stoppage, exit, conclusion, denial, block. And Jehovah wrote the stars and their pathways upon the face of the firmament. All the little stories, like pathways running backward into the distance and ever converging, met somewhere in lost ages; they met in forest worship and they met in some sacrifice by the human heart.